All of the products listed are completely friendly to the environment. All are non toxic, free of harmful VOC content, and easy to use. Wood Vitality is a two step waterborne product that impregnates wood with zinc borate, a very well-known, almost insoluble material that is safe for humans and does not interfere with any later wood-treatment or staining or finishing product. Kit contains two one gallon containers. Each container is used at different times. "DO NOT MIX"
Universal Hard-Surface Primer (formerly known as Damp Concrete Primer) self-emulsifies by mixing with water. This makes it more economical than two-component epoxy primers for applying any maintenance or protective coating to concrete. Since it contains no solvents, it is legal to apply anywhere on any structure . You save money as well as gaining better coating reliability. When your work lasts and the customer sees your work stays stuck, year, after year, you'll get more word-of-mouth referral business. Aqua-Strip™ is a technically advanced, safer marine stripper designed to remove 10+ thick layers of marine anti-fouling, top-side and other paints and varnishes in one application. Although stronger than Ready Strip, Aqua-Strip will not damage the gel coat, fiberglass or any surface. 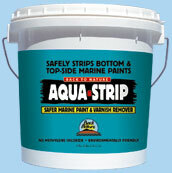 Aqua-Strip stays wet for extended periods of time to penetrate and lift bottom layers. It is environmentally safe, biodegradable, non-flammable, and contains no methylene chloride or caustic. Aqua-Strip™ is odor-free and can be easily cleaned up with water. As a paste it clings easily to vertical surfaces. For application, it can be brushed, rolled or sprayed. It requires no neutralization (neutral pH). Ready-Strip® Marine changes color to signal removal time and is specifically designed to remove up to 5 thick layers of marine anti-fouling, top-side and other paints and varnishes in one application. It is applied as a blue and turns light blue when the paint is ready to be removed. 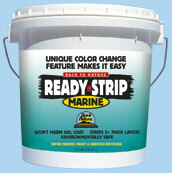 Ready-Strip® Marine will not damage the gel coat or any surface. Ready-Strip® Marine stays wet for extended periods of time to penetrate and lift bottom layers, also making it possible to strip larger areas at one time. It is environmentally safe, biodegradable, non-flammable, non-combustible and contains no methylene chloride or caustic. 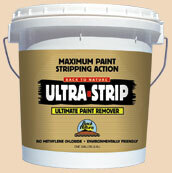 Ultra-Strip™ , the ultimate safe marine coatings remover is designed to remove multiple layers of marine anti-fouling, Two part finishes, top-side and other paints and varnishes in one application. Where speed of removal is critical, a lighter coat of Ultra-Strip™ will remove 1 layer in as little as 15 minutes and 2 to 4 layers in under 4 hours. For tougher jobs or coatings, a heavier application will remove the paint in one application. This product is environmentally safe, biodegradable, non-flammable, and contain no methylene chloride or caustic. It is odor-free and can be easily cleaned up with water. For application, it can be brushed, rolled or sprayed.It requires no neutralization (neutral pH). Rainguard® Winterizer is the ultimate winter home protection, designed to protect from the ravishes of ice, rain and snow. Formulated with Micro-Lok® technology, Winterizer creates a micro-molecular chemical and mechanical bond between the winterizer chemicals and the surface it has been applied to, preventing moisture from penetrating the surface. Winterizer also prevents cracking and breaking of wood and masonry caused by continuous freeze/thaw cycles. 6 Fluid ounce bottle diluted with water to create 1 gallon of product. • Est. Coverage Rates: Porous Surfaces 80 – 150 sq.ft./gallon Dense Surfaces 150-200 sq.ft./gallon. • Dries in approx. 1 hour. Clean up with soap and water.